with Reserved Font Names &amp;quot;Dosis&amp;quot;. Designed by Edgar Tolentino, refined & extended by Pablo Impallari, spaced & kerned by Igino Marini iKern. 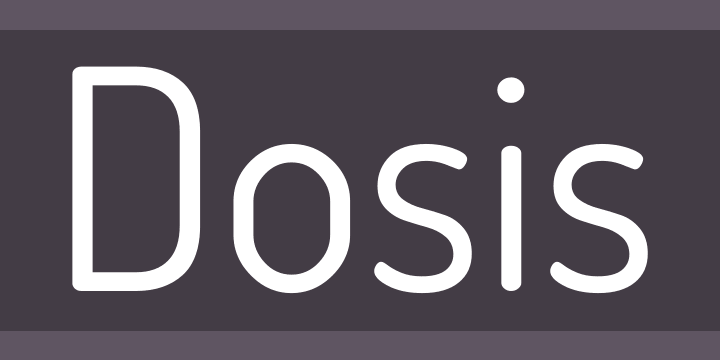 Dosis is a very simple, rounded, sans serif family. The lighter weights are minimalist. The bolder weights have more personality. The medium weight is nice and balanced. The overall result is a family that’s clean and modern, and can express a wide range of voices & feelings. It comes in 7 incremental weights: ExtraLight, Light, Book, Medium, Semibold, Bold & ExtraBold. We like you to have some freedom over how the letters should look, so we bundled Dosis with a few alternates that you can use to make your text look the way you want to. You can access all of them by selecting “Stylistic Alternates” in Photoshop, or activate one by one using Stylistic sets 1 to 5 in InDesign.